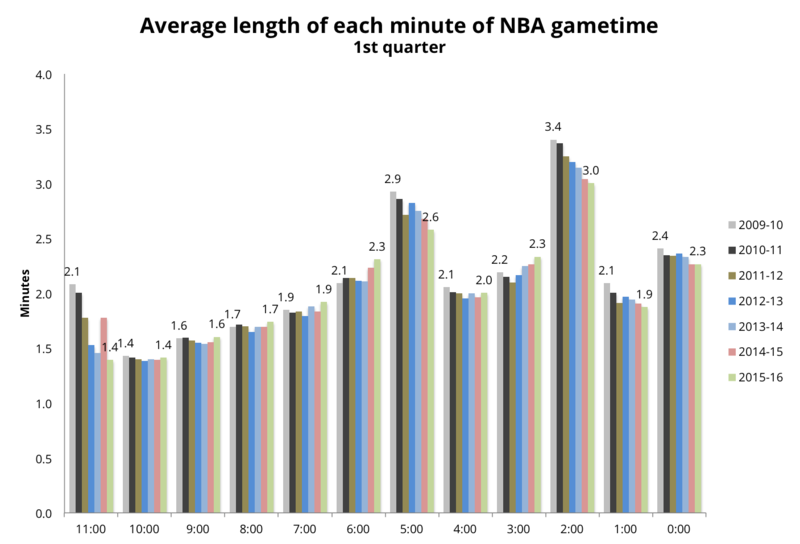 In a post on the length of NBA games, I noted a trend in the length of each minute. The average length of the 5:00 minute in the 1st quarter (between 5:59 and 5:00 on the game clock) has been dropping steadily, from an average of 2.9 minutes to 2.6 minutes. And on a related note, the average length of the 6:00 minute has been increasing. There must be two 100-second timeouts in the first and third periods and three 100-second timeouts in the second and fourth periods. If neither team has taken a timeout prior to 5:59 of the first or third period, it shall be mandatory for the Official Scorer to take it at the first dead ball and charge it to the home team. If no subsequent timeouts are taken prior to 2:59, it shall be mandatory for the Official Scorer to take it and charge it to the team not previously charged. Confused? Put simply, if a timeout has not been taken by 5:59 in the 1st quarter, one is automatically charged to the home team at the first available opportunity. 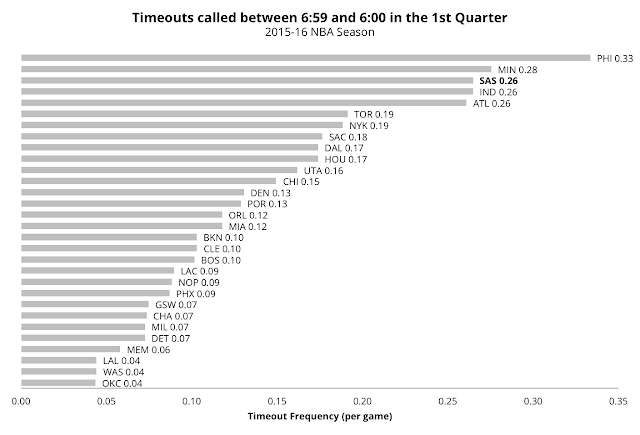 In recent years, though, teams have been taking more timeouts prior to that 5:59 cutoff. In 2008, NBA teams averaged 0.09 timeouts per game between 6:59 and 6:00 in the 1st quarter (i.e. right before the cutoff). In 2015, that average has increased by 50 percent to 0.14 per game. Spurs coach Gregg Popovich has been at the forefront of this micro-trend. In 2008-09, the Spurs were an extreme outlier, averaging 0.37 timeouts per game in minute 6:00, four times the league average. This season, however, the Spurs have a lot more company at the top. The Philadelphia 76ers average a league leading 0.33 timeouts per game in minute 6:00 of the 1st quarter. The 76ers are coached by Brett Brown, a member of the Gregg Popovich coaching tree. Also on that tree is Atlanta head coach Mike Budenholzer. And not coincidentally perhaps, the Hawks are at the top of this chart as well. The Pacers are coached by Frank Vogel, who is not a member of Pop's coaching tree. However, their general manager, Kevin Pritchard, served under Popovich as a scout for the Spurs (I may be reaching here). 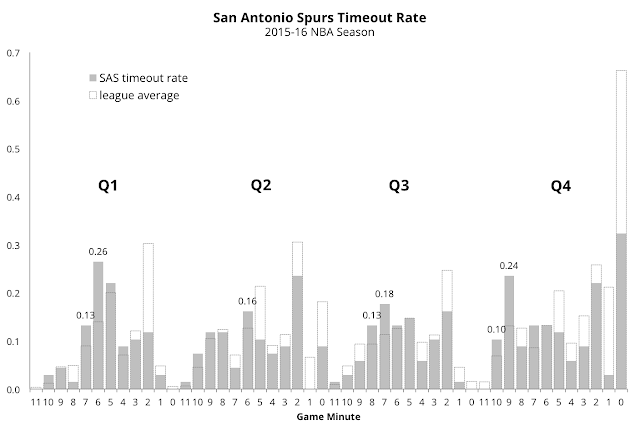 The Spurs' uniqueness in their timing of timeouts extends beyond minute six of the first quarter. In general, Popovich seems to favor timeouts just before the "mandatory" timeout phase kicks in. In the 2nd and 4th quarters, a mandatory timeout is called in minute 8:00 provided that a timeout has not been called prior to that point. And we see that the Spurs' timeout rate is higher than league averages for minutes 10:00 and 9:00, particularly in 4th quarter. Popovich is averaging 0.24 timeouts per game in minute 9:00 of the 4th quarter, nearly twice the league average of 0.13. Is there an underlying rationale behind all this gamesmanship? In a fantastic post for Nylon Calculus on matchup patterns and substitutions, Seth Partnow noted that the Spurs are unique when it comes to maintaining balance between playing starters and its bench. 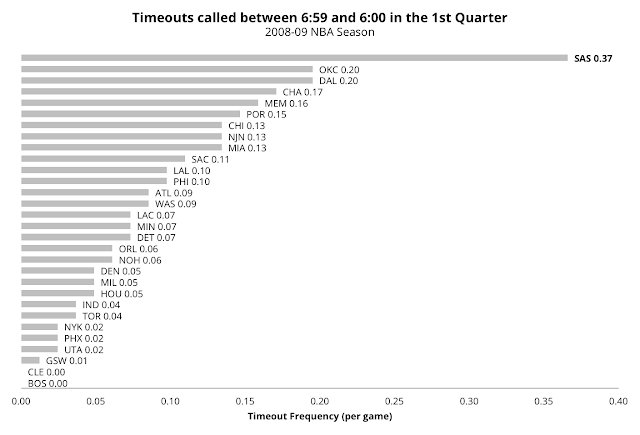 Perhaps the timing of the Spurs timeouts is part of a broader strategy of optimizing rest periods for its veteran core? Or maybe Gregg Popovich likes control, and simply takes umbrage at timeouts being called by fiat?